Did you know that Tuesday was the first day of fall? What more of an excuse does a girl need to get her fall decorating on? Not much if you ask me. So after spending the last couple of days in our living room revamping our couch and throw cushions, I figured our living room coffee table would be the best place to start. 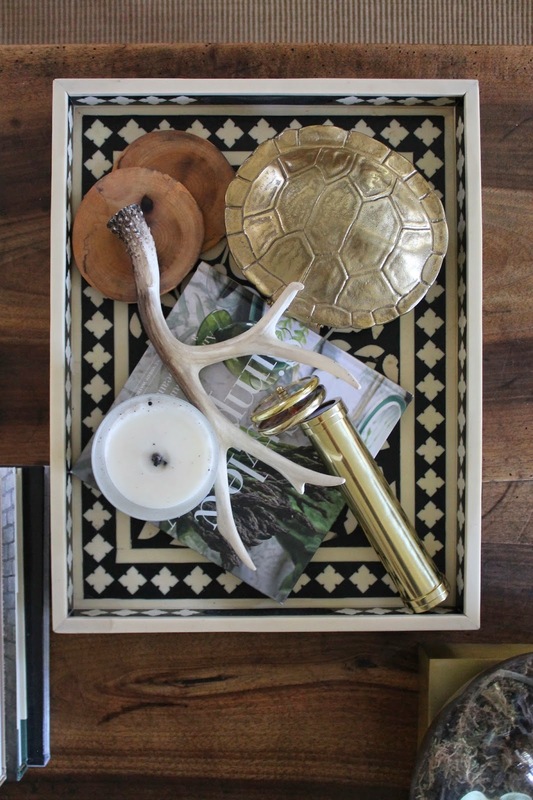 Coffee table styling can be tricky, so I always try to stick to these principals: a tray or container to corral the pretties, something stacked for height and something living. The styling fundamentals stay the same, it's the finishing touches that change seasonally. When it comes to fall decorating, I don't like to go too over the top fall-wise, but I do like to highlight some of nature's natural beauty. Of course, even nature has to be kept in check. Woods balanced by metallics, rustic balanced by more modern finishes. Starting with the black and white bone inlay tray as my modern base, I layered some standard neutrals like the book and candle. 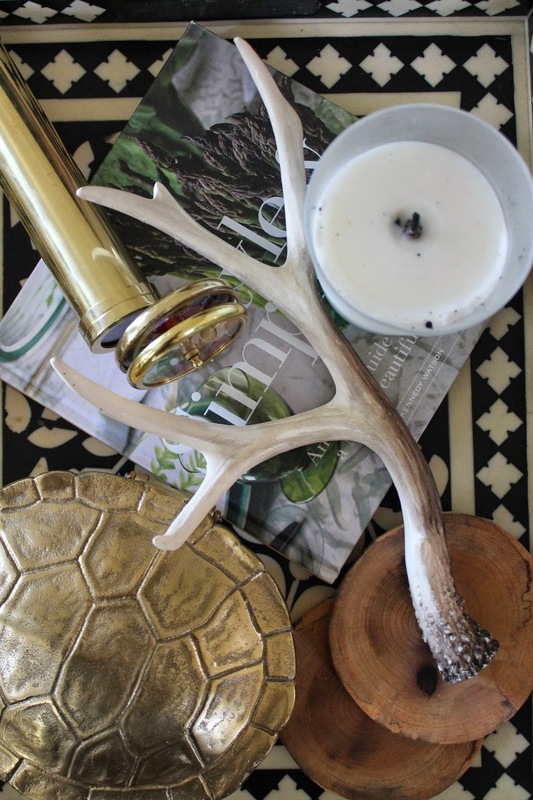 Then, the rustic fall inspired finishes: wooden coasters, brass faux tortoise hinged box (thank you Nate Berkus for Target) and faux whitewashed antler. I can't really end this post without talking about the elephant in the room, the pumpkin. It's mid September and I've clearly said I don't do OTT fall decorating. In my defense, it's a white pumpkin so it's far less fall-ish than an orange pumpkin AND it's fall y'all! so, I'm all good.